Jetbull have a fantastic welcome offer that new players can take advantage of when they sign up with them. This is a unique offer, where the punter gets a free bet that is valued at more than the qualifying bet they have to place. The qualifying bet is £20 to activate the offer, with the free bet being a huge £50 that you receive. This is an offer that all sports fans can take advantage of, but this is especially good for football fans. The £20 qualifying bet needs to be placed on any football game from a European league, which is great news for football fans but with some of the biggest leagues in Europe, non-football fans will still be able to get involved. If you are interested in claiming this great Jetbull welcome offer then all you need to do is follow the steps below. When signing up to a new account with Jetbull and claiming this offer, here are the main terms and conditions that you need to follow. Accumulator players are going to love this offer from Jetbull, which gives you the chance to bag a free £10 accumulator bet every day. Simple place five accumulators with them with a minimum stake of £10, two selections or more and cumulative odds of 4/5 or greater. After you have done this and the bets have been settled, simply contact support and they will credit the free bet to your account. 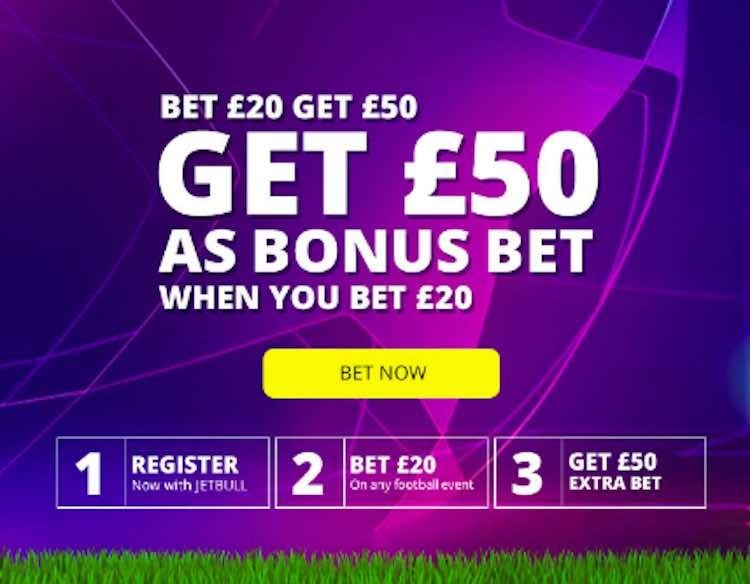 There is a limit of 1 free bet per day, but if you are a daily accumulator punter then you could bag yourself a free bet every single day of the week, which is going to increase your chances of winning and building up your betting profit. Regular accumulator punters should certainly check this offer out.